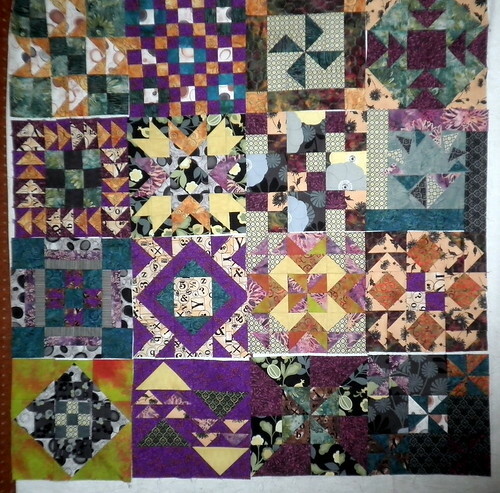 My goal with this quilt for the week was to get the borders on so I could get them to Barb for quilting. I thought I’d have until this Saturday but Barb ended being in town visiting her daughter so I managed to get the borders on two of my quilts last Thursday and delivered them on Friday for her to take home. 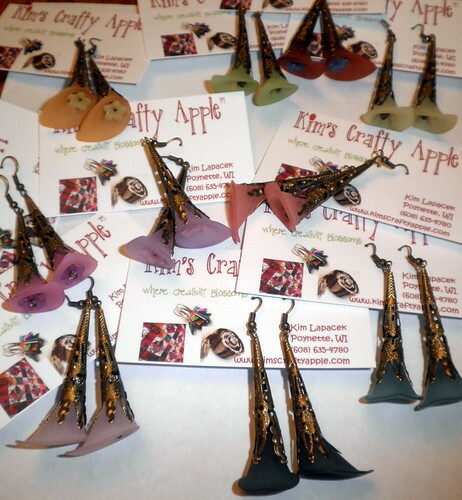 If she got to them this week I should be able to see them tomorrow (fingers are crossed…). Here’s the first set of borders I added. 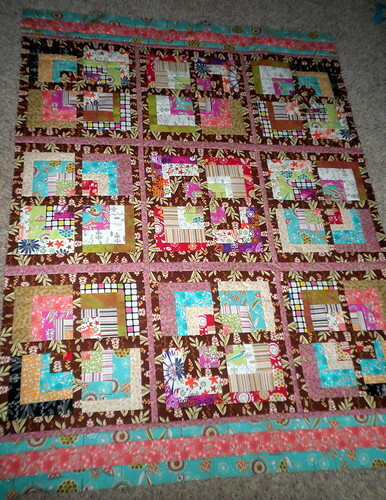 I really wanted to be elongated so it would be the perfect lap size so I added a few extra strips onto the ends. I used the same pink tiny floral patterned fabric that I had used in the interior sashing for my exterior borders. 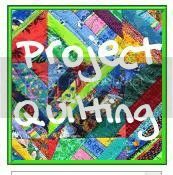 The plan in my mind, as of right now, is to bind the quilt with the brown fabric from the first sashing to sort of ‘close’ the quilt. 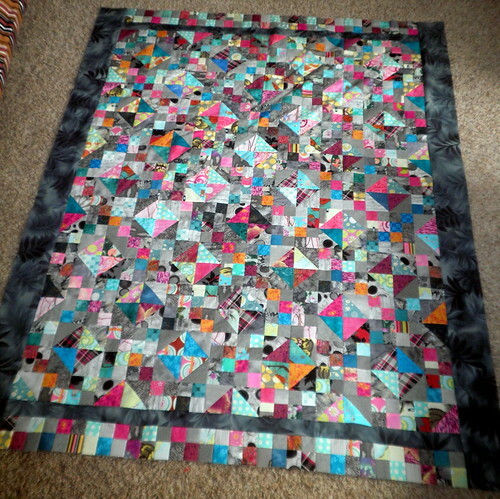 The other quilt I managed to get bordered is this Mystery Quilt. 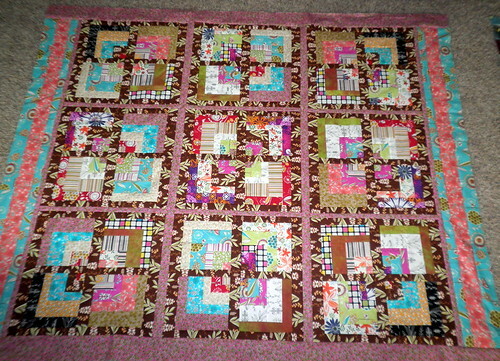 Again, I wanted to elongate it so I added a special detail from some of my square patches I had extra’s off from piecing the middle. 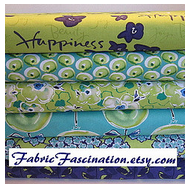 I also managed to snag a great piece of leafy grey fabric from Diane’s stash for the borders. 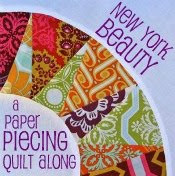 I really love how this changed the entire look of the quilt. 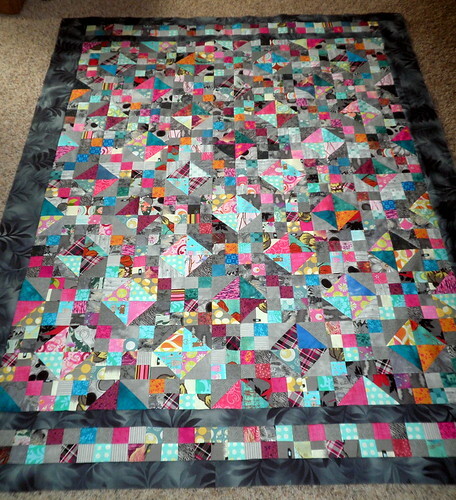 The piecing really pops now and the teals/turquoises I used pull out the ‘blue’ in the grey fabric I bordered with. 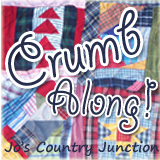 It really is gorgeous – can’t wait to see what Barb decides to do with the quilting! I haven’t progressed passed finishing all 16 blocks on this one. 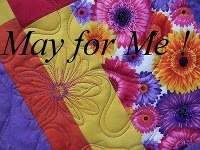 A ‘sneak peak’ at the quilt top has been posted but I’m waiting for further instructions on that. 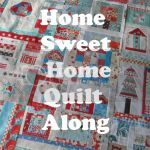 I have a feeling I’ll be adding my own twist to the final quilt but I do really want to follow what the quilt-a-long as closely as possible since that’s a challenge for me in itself. 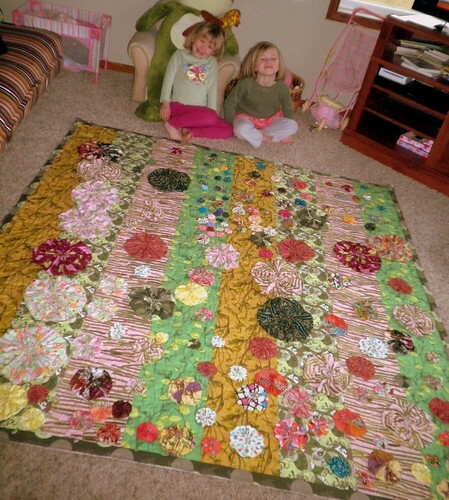 I had my two lovely girls layout the yoyo’s on the quilt for me this morning (and they picked them up too). So, I thought it was only fair to put them in the picture with all their hard work. 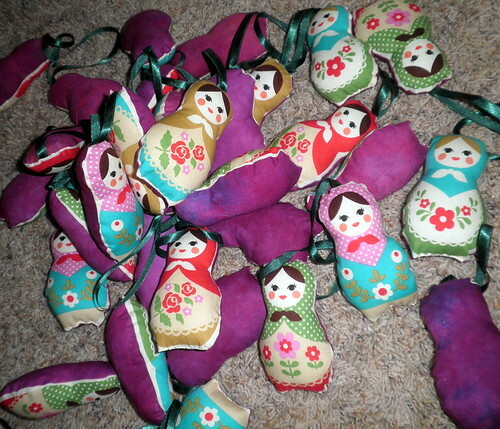 This little matryoshka doll ornament project is going faster than I thought it would. All the machine stitching is done. 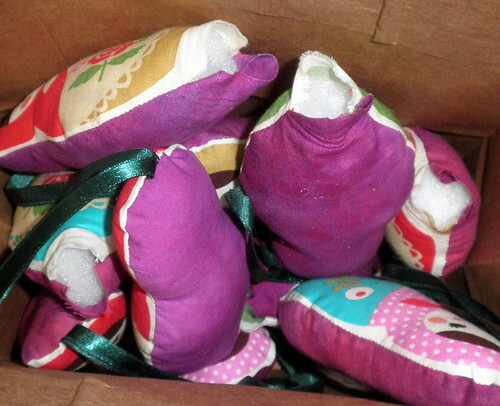 They are stuffed with batting. 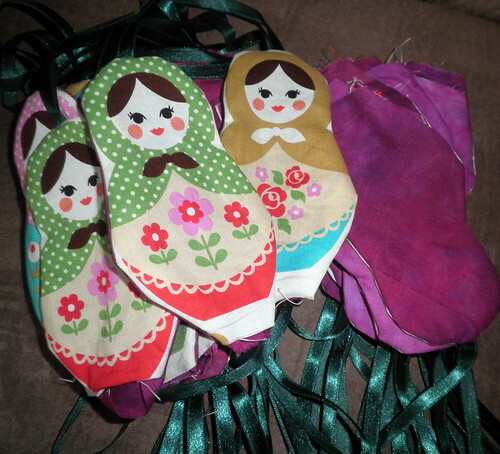 AND I have about 35ish hand stitched shut – way over half done and even a day+ past my 11/day goal for these. If things continue this way I could be done before the end of the week! 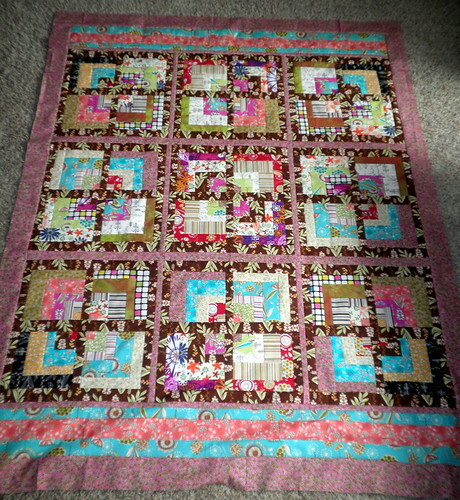 DONE and will be heading to Barb for quilting on Saturday. 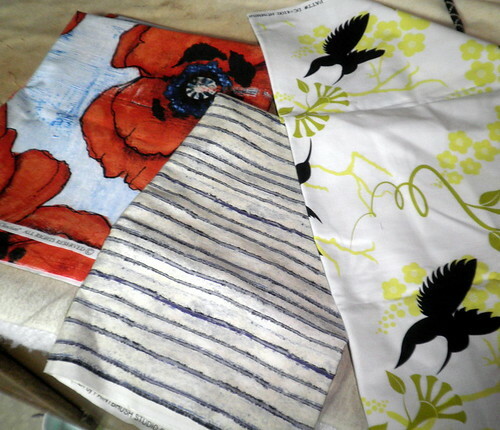 Here are the main fabrics for my ‘Large Scale’ print piece. I think I’m going to wait a little bit before I post more – but I’ll give you a hint – LOVE Ricky Tim’s Convergence Technique! 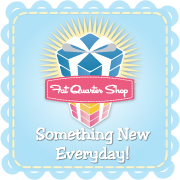 I also really wanted to get my consignment shops stocked up before this baby decides to join us so I sent a nice size box full or earrings, rings, and bracelets off to the Project M Boutique in Riverwest, Milwaukee.